Background: Dental implant is an artificial tooth root-fixed into the jaws to hold a replacement tooth or bridge. Functional surface modifications by organic material such as propolis coating seem to enhance early peri-implant bone formation, enhancing the initial cell attachment. The aim of the study was to study the expression of osteocalcin (OC) and type I collagen (COLL1) as bone formation markers in propolis-coated and -uncoated implant in interval periods (1, 2, 4, and 6 weeks). Materials and Methods: Commercially pure titanium (cpTi) implants, coated with propolis protein, were placed in the tibias of 40 New Zealand white rabbits, histological and immunohistochemical tests for detection of expression of OC and COLL1were performed on all the implants of both control and experimental groups for (1, 2, 4, and 6 weeks) healing intervals. 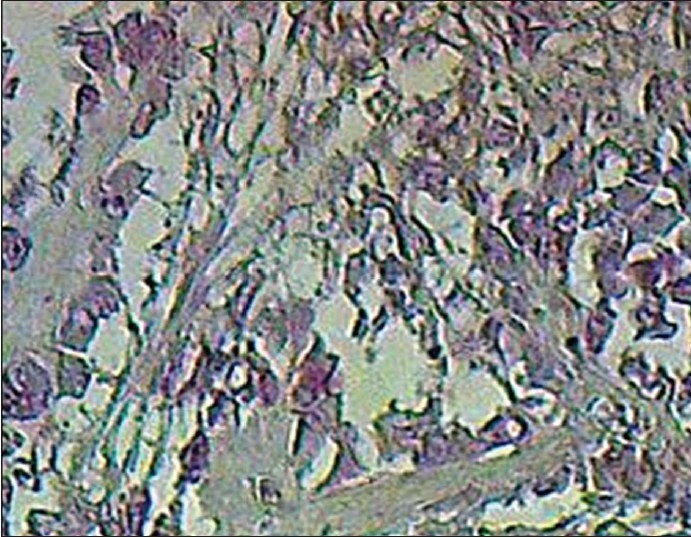 Results: Histological finding for coated titanium implant with propolis illustrated an early bone formation, mineralization, and maturation in comparison to control. 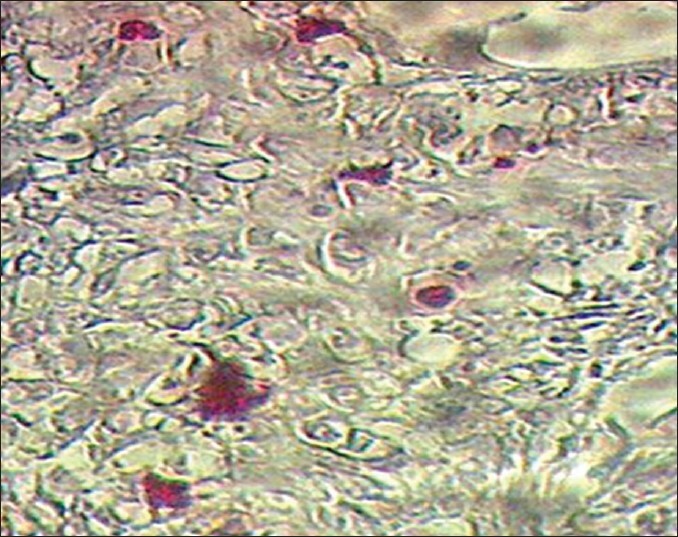 Immunohistochemical finding showed that positive reaction for OC and COLL1 was expressed by osteoblast cells at implants coated with propolis, indicating that bone formation and maturation was accelerated by adding biological materials as a modification modality of implant surface. Conclusion: The present study concludes that coating of implants with propolis showed increment in osseointegration in short interval period. Sabir et al.,  reported the propolis is capable of stimulating the production of transforming growth factor-beta1 (TGF-B1). Al-Molla,  showed that propolis enhanced the bone formation when implanted in a defect in the mandible. FortyNew Zealand rabbits aged 10-12 months were used in this study, they were divided into four groups for (1, 2, 4, and 6 weeks) healing intervals, 10 animals for each period. Animals were generally anesthetized and atraumatic surgical technique was performed to prepare two holes in the tibia; propolis-coated implant was inserted in one hole and uncoated implant (control) placed in the second one. All tissue specimens, samples and controls, were fixed in 10% neutral formalin and processed in a routine paraffin blocks. 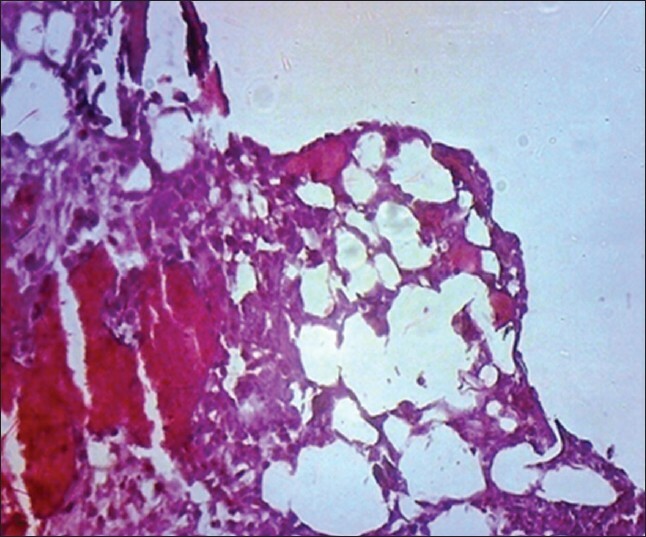 Each formalin-fixedparaffin-embedded specimen had serial sections were prepared as follows: Five micrometer thickness sections were mounted on clean glass slides for routine hematoxylin and eosin staining (H and E), from each block of the studied sample and the control group for histopathological reexamination. Other four sections of 5μm thickness were mounted on positively charged microscopic slides to obtain a greater tissue adherence for immunohistochemistry. 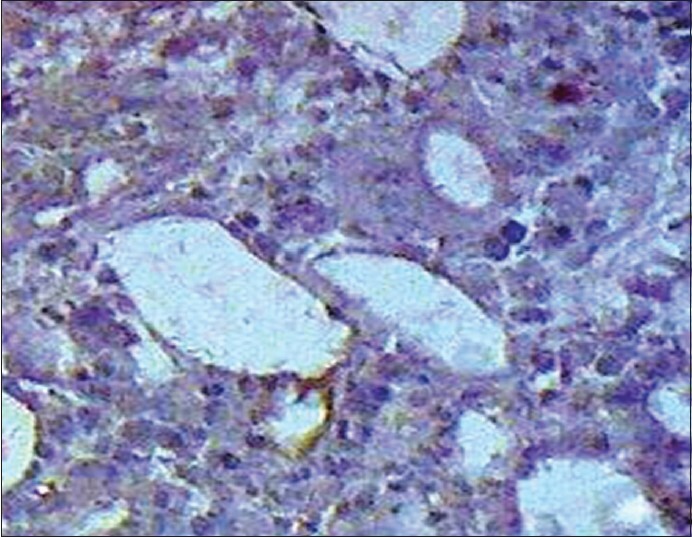 The procedure of the immunohistochemical (IHC) assay adapted by this study was carried out in accordance with the manufacturer's instructions (Abcam, UK). 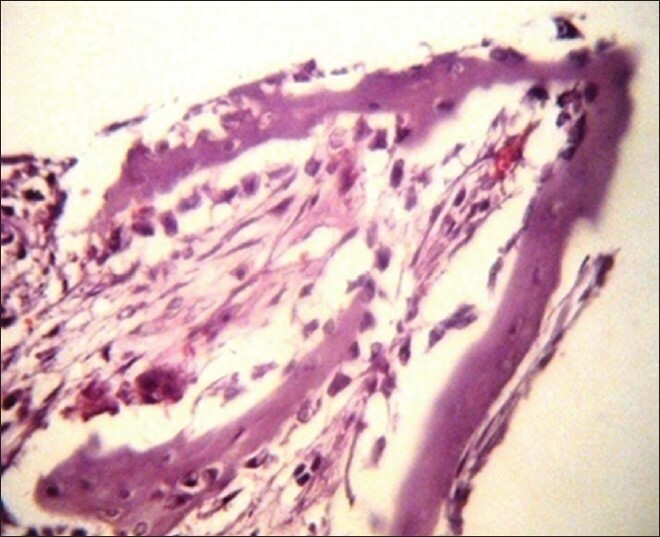 Threads in the marrow space followed the shape of the screw showed bone trabeculae within woven bone, large and more fat cells with small amount in between them appeared in the marrow space, large number of active mitotic progenitor, and osteoblast cells [Figure 1]. 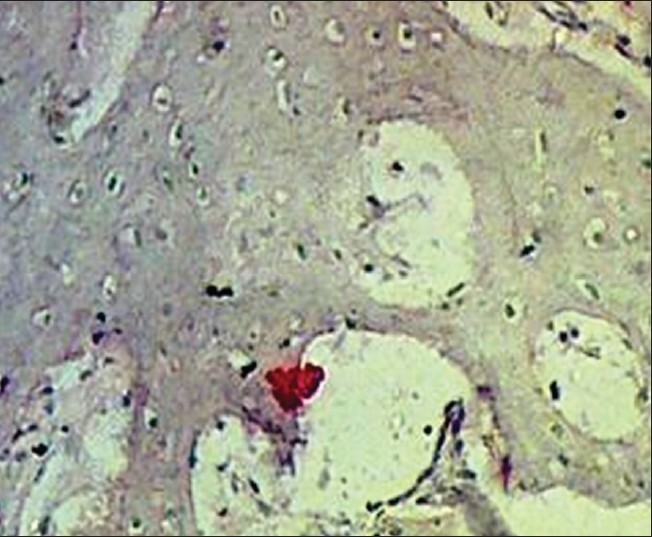 In uncoated implants, the marrow space showed large number of fatty tissue with granulation tissue with large blood vessels, no woven bone shown [Figure 2]. 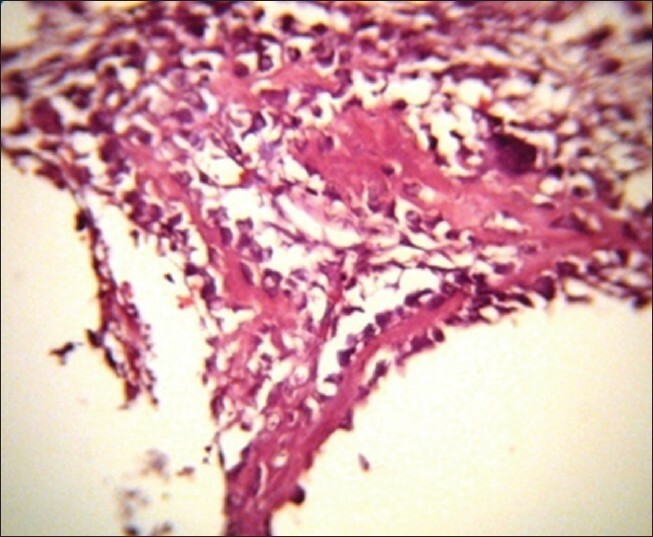 Microphotograph view of bone section shows thick bone trabeculae with reticulofiber tissue scattered between them and large number of the osteocytes embedded within these trabeculae, raw of osteoblasts and other of osteoclasts arranged on the periphery of the trabeculae is shown in [Figure 3]. In control group, a number ofactive osteoblast and progenitor cells scattered within woven bone, with few thin bone trabeculae involve preosteocytes and osteocyteswere observed [Figure 4]. 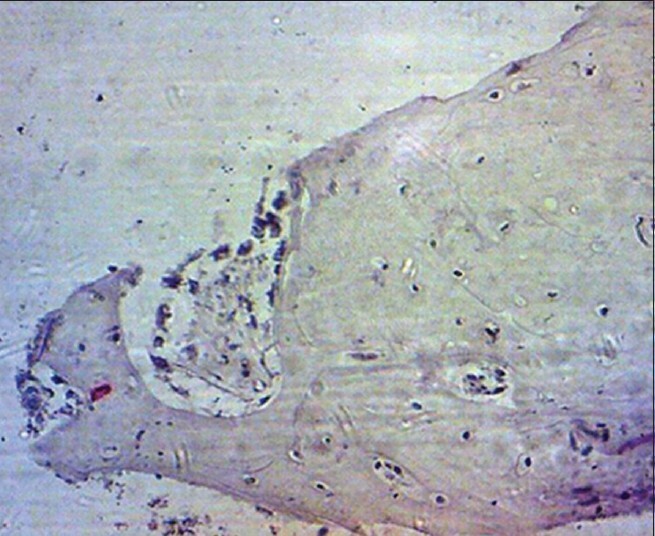 Bone thread developed after 4 weeks of implantation shows thick bone trabeculae with active bone forming cells and progenitor cells in between them, osteoid tissue formed at the periphery of the trabeculae [Figure 5], control one show threads formed at the site of the implant with thin bone trabeculae and reticulofiber tissue in between them [Figure 6]. 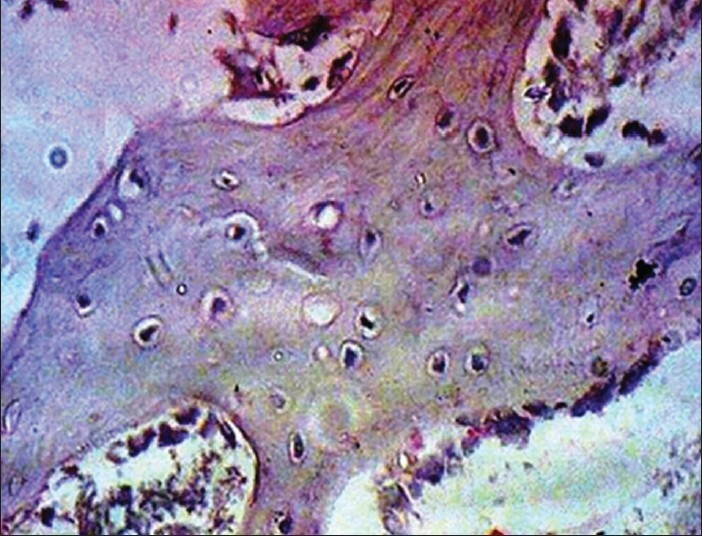 Mature bone shown in [Figure 7], in the thread area of implant coated with propolis, bone deposit around uncoated implant (control) in a form of thread with thick bone trabeculae in control group [Figure 8]. Propolis-coatedimplantsstaining with OC monoclonal antibody showed that OC expression was strong positive in the osteoblasts, osteocytes, and progenitor cells [Figure 9]. 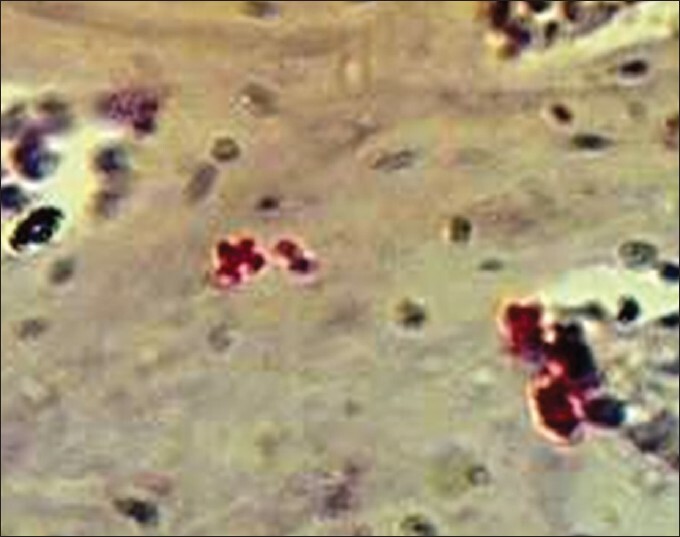 Uncoated implants, negative expression of OC monoclonal antibody on uncoated implant in progenitor, fatty cells, and extracellular matrix [Figure 10]. 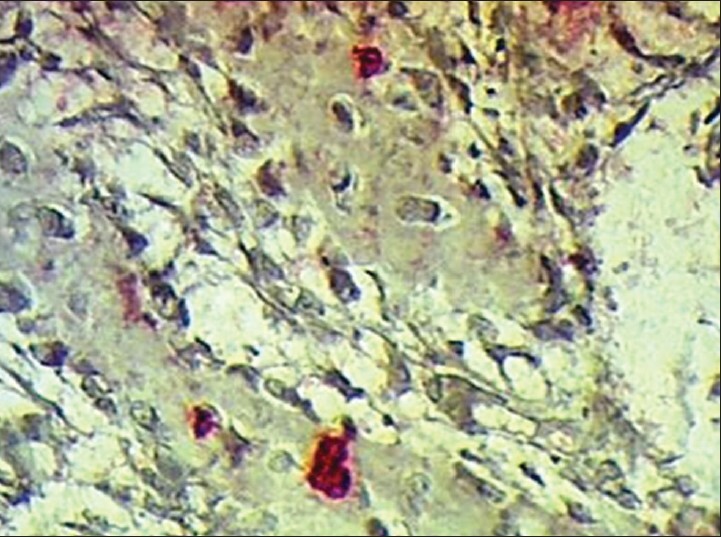 The immunohistochemical staining with OC monoclonal antibody at 2 weeks of healing period showed that OCexpression was moderate positive in osteoblasts and osteocytes [Figure 11]. Uncoated implantsshowed that OC expression was strong positive in the osteoblasts, osteoclasts, osteocytes, progenitor cells, and extracellular matrix [Figure 12]. 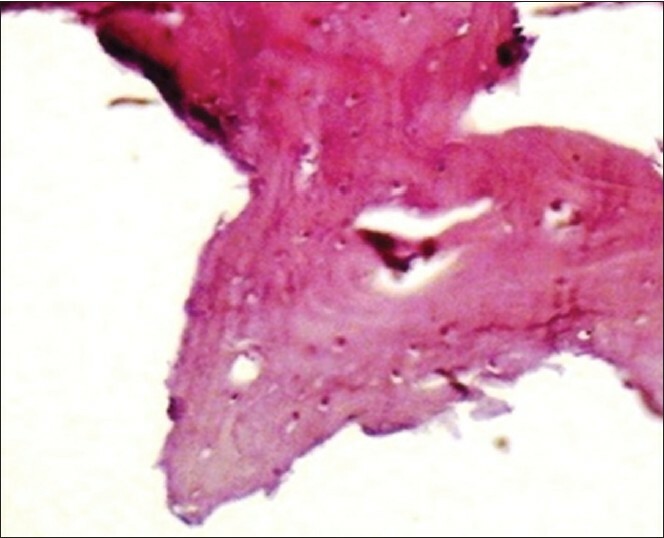 Propolis-coated implants showed that OC localization was weakly positiveexpression in osteoblasts, progenitor cells [Figure 13]. While the uncoated implants, moderate positive expression in osteoblasts and osteocytes, progenitor cell in 4 weeks interval, but showed weakly positiveexpression in 6 weeks postoperatively [Figure 14]. Propolis-coated implants showed that OC localization was weakly positiveexpression [Figure 15]. While the uncoated implants, weekly positive expression [Figure 16]. 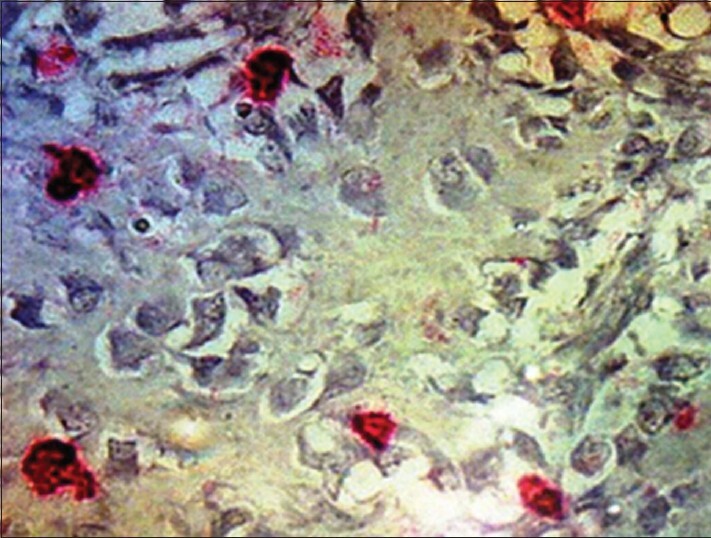 Propolis-coated implants staining with COLL1 monoclonal antibody showed that COLL1 expression was strong positive in the osteoblasts, osteocytes, and progenitor cells [Figure 17]. 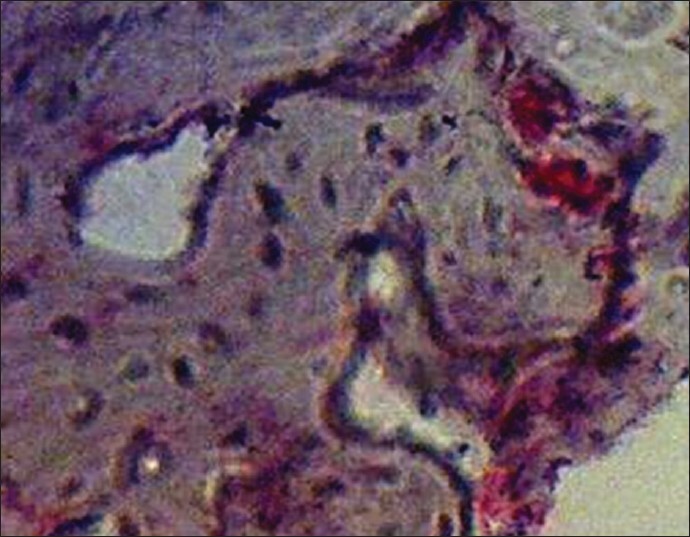 For uncoated implants, weak positive expression of COLL1 monoclonal antibody on uncoated implant in osteoblasts, osteocytes, and progenitor cells [Figure 18]. 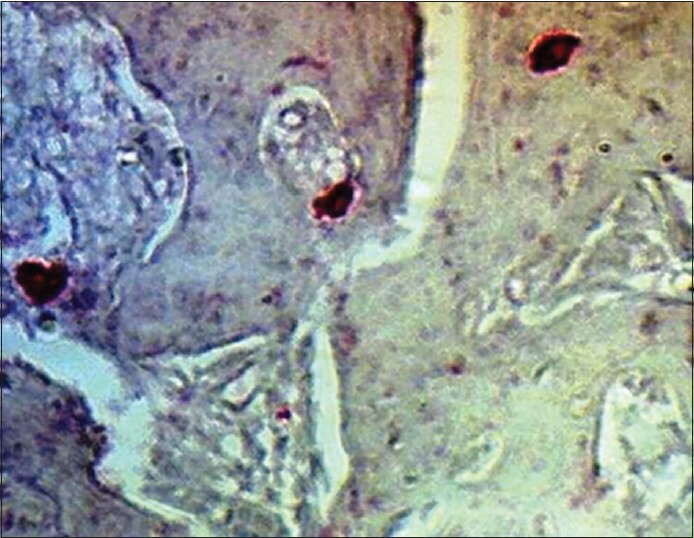 Propolis-coated implants, the COLL1 expression was weak positive in osteoblasts and osteocytes [Figure 19]. Uncoated implantsshowed that COLL1 expression was strong positive in the osteoblasts, osteoclasts, osteocytes, progenitor cells, and extracellular matrix [Figure 20]. Propolis-coated implants, COLL1 monoclonal antibody at 4 weeks of healing period showed weak positive expression in osteoblasts, progenitor cells, and the extracellular matrix [Figure 21]. In uncoatedimplants; moderate positive expression in osteoblasts, progenitor cell, blood vessels, and extracellular matrix [Figure 22]. COLL1 localization showed negative expression in osteoblasts and osteocytes [Figure 23]. Uncoated implants, the COLL1 localization was weakly positive expression in osteoblasts at the periphery of the boneand progenitor cells [Figure 24]. 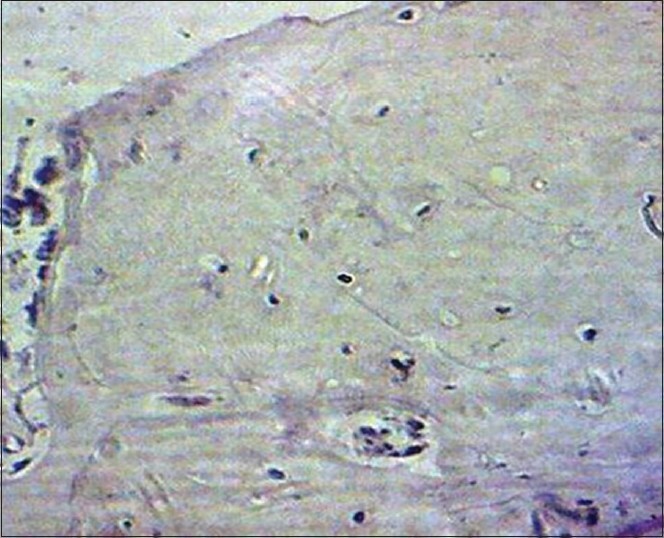 The uncoated implants, at 1 week duration, embryonic connective tissue with active collagen fiber deposition were showed around implant; this result agreed with finding of Jamil,  who reported that within 1 week, embryonic connective tissue with active collagen fiber around the implant which represent organic constitution of bone would be formed. 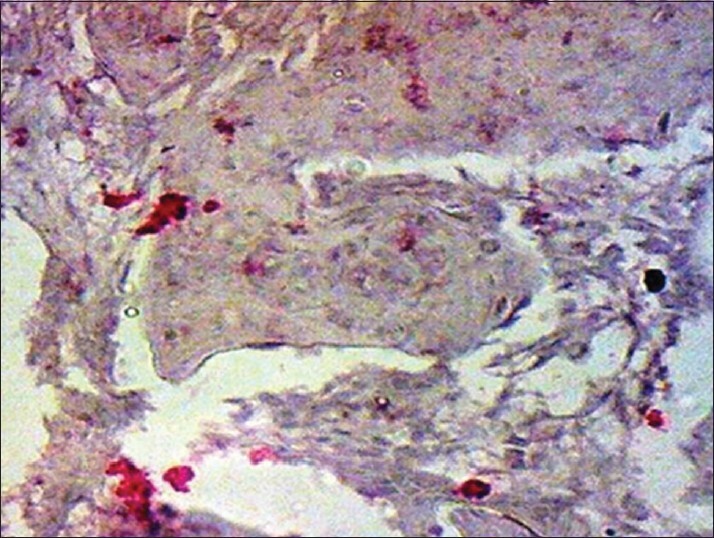 Uncoated Ti implant in rabbit tibia after 2 weeks of implantation shows a number ofactive osteoblast and progenitor cells scattered within woven bone, with few thin bone trabeculae. These finding shave been supported by the results of Niehaus et al.,  who found more osteons had uptake of bone marker on day 14 than at any other time during the study new bone was visible within the area between the threads of the control screws. 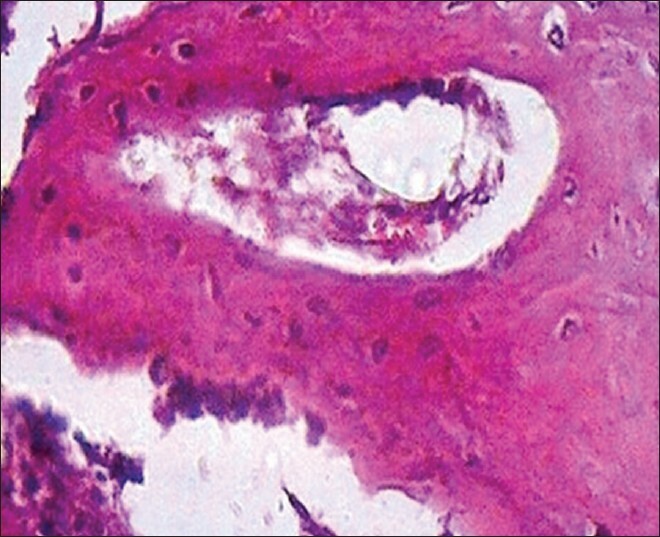 At 4 weeks duration, according to the study conducted by Yoshinari et al.,  the micrographs of the implant-bone interfaces at 4 weeks after implantation show that bone tissue has grown on the implant surface; while after 6 weeks duration, thickbone trabeculae and large number of bone forming cells on the border of bone trabeculae and this agree with Depprich et al.,  who found that when the healing period was near to 6 weeks. 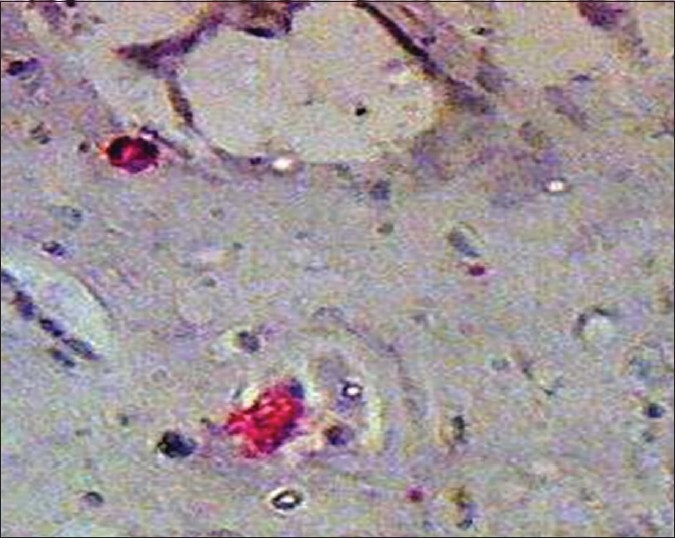 The propolis-coated implants, at 1-2 weeks durationthe threads in the marrow space followed the shape of the screw showed bone trabeculae, osteocytes embedded within these trabeculae, raw of osteoblasts, and other of osteoclasts arranged on the periphery of the trabeculae. This result agree with Al-Molla,  who showed an increase in bone formation in 1 and 2 weeks in comparison to the control group. 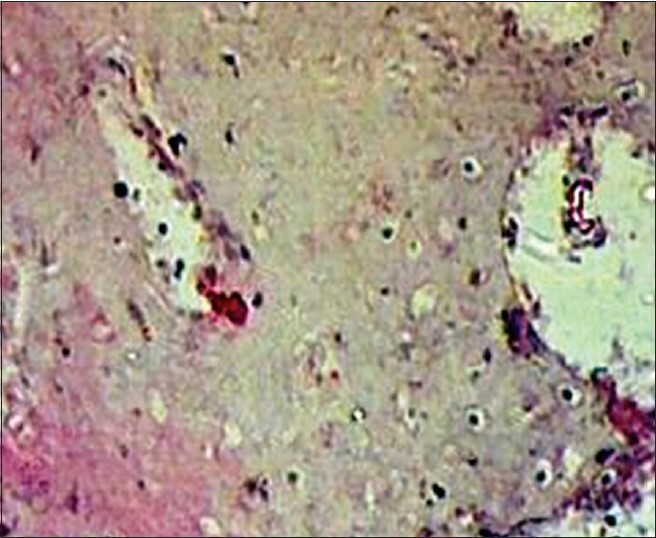 At 4 and 6 weeks duration, micrograph view of bone thread shows thick bone trabeculae with active bone-forming cells and progenitor cells in between them and osteocytes within their lacunaealso theosteon appeared. Propolis not only decreased apoptosis but also increased the metabolic activity and proliferation of periodontal ligament (PDL) cells. A great portion of these flavonoid molecules seem to have their effects on bone through an estrogen-like activity and have been therefore termed phytoestrogens. Toker et al.,  showed propolis significantly reduced the periodontitis-related bone loss, the findings of this study provide morphologic and histological evidence that propolis, when administered systemically prevents alveolar bone loss in the rat model. Also the result agreed with Al-Molla,  who showed that the propolis take the higher score in bone healing criteria in comparison to other groups in 4 weeks interval. 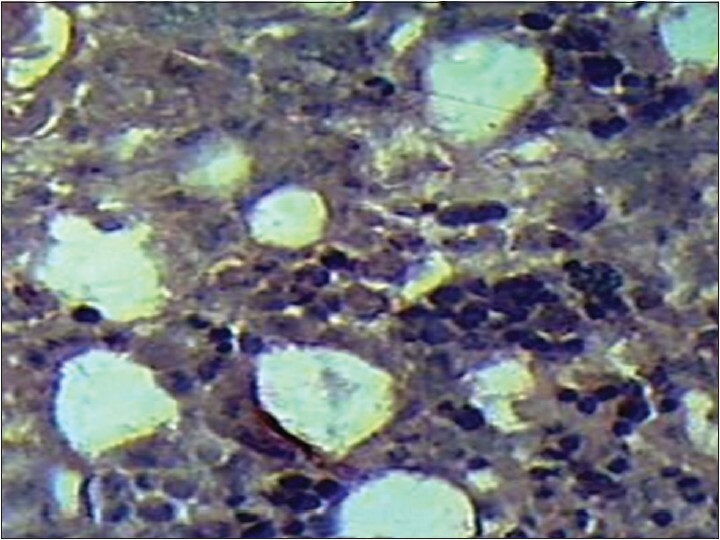 OC expression was strong positive in the active mitotic osteoblast, and progenitor cells in all experimental groups at 1 week interval. OC seems to have a role in the early stages of bone formation and some studies by Al-Ghani et al.,  suggest that it is chemotactic for osteoclast and regulate osteoblast activity too. Our results shows a greater number of positive cells indicate a more rapid tissue reaction on implant surface. Novaes et al.,  who reported that OC, as one of the important indicators of osteogenic differentiation and bone tissue formation, have been shown to express at higher levels on modified titanium surfaces. 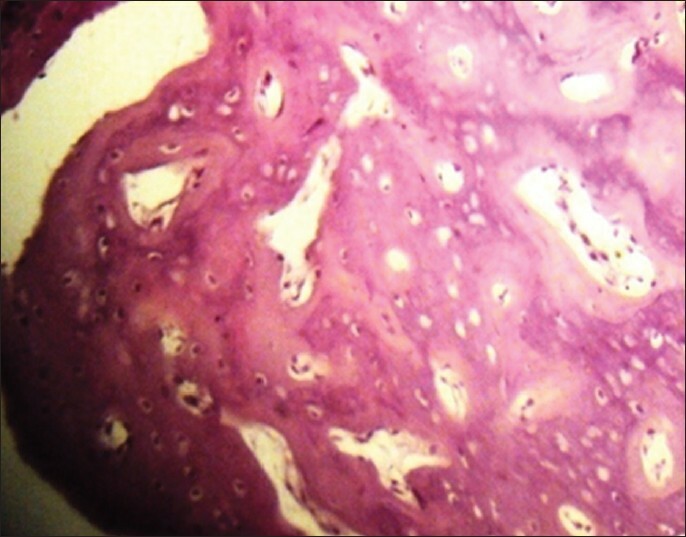 In vitro studies demonstrated that mRNA of COLL1 is expressed during the initial period of proliferation and extracellularmatrix biosynthesis, since it is hypothesized that enhanced expression of osteogenic markers in vitro leads to more and more expeditious bone formation at the bone-biomaterial interface in vivo. COLL1 is a bone marker associated with the differentiation of osteocyte,  and this agree with the results in this study where the osteocyte express COLL1. Alghamdi HS, Cuijpers VM, Wolke JG, van den Beucken JJ, Jansen JA. Calcium-phosphate-coated oral implants promote osseointegration in osteoporosis. J Dent Res 2013;92:982-8. Naitoh M, Nabeshima H, Hayashi H, Nakayama T, Kurita K, Ariji E. Postoperative assessment of incisor dental implants using cone-beam computed tomography. J Oral Implantol 2010;36:377-84. Hayashi M, Jimbo R, Lindh L, Sotres J, Sawase T, Mustafa K, et al. In vitro characterization and osteoblast responses to nanostructured photocatalytic TiO2 coated surfaces. Acta Biomater 2012;8:2411-6. Bougas K, Jimbo R, Xue Y, Mustafa K, Wennerberg A. Novel implant coating agent promotes gene expression of osteogenic markers in rats during early osseointegration. Int J Biomater 2012;2012:579274. Hellner M, Winter D, von Georgi R, Münstedt K. Apitherapy: Usage and experience in german beekeepers. Evid Based Complement Alternat Med 2008;5:475-9. Silva FB, Almeida JM, Sousa SM. Natural medicaments in endodontics -- a comparative study of the anti-inflammatory action. Braz Oral Res 2004;18:174-9. Havsteen BH. The biochemistry and medicinal significance of the flavonoids. Pharmacol Ther 2002;96:67-202. Shieh DB, Yang SR, Shi XY, Wu YN, Wu SN. Properties of BK (Ca) channels in oral keratinocytes. J Dent Res 2005;84:468-73. Duarte S, Koo H, Bowen WH, Hayacibara MF, Cury JA, Ikegaki M, et al. Effect of a novel type of propolis and its chemical fractions on glucosyltransferases and on growth and adherence of mutans streptococci. Biol Pharm Bull 2003;26:527-31. Markelov V, Trushin M. Bee venom therapy and low dose naltrexone for rreatment of multiple sclerosis. Nepal Neurosci 2006;3:71-7. Chai L, Ang E, Pavlos N, Yip K, Steer J, Joyce D, et al. Caffeic acid phenethyl ester, a natural component of honey bee propolis induce osteoclast apoptosis and attenuates osteo-clastogenesis via the suppression of rankl-nduced NF-KB and NFAT activity. ANZBMS. Ann Sci Meet 2005. Milot B. Effects of soy isoflavone supplementation on bone mineral density. Herb Clip 2006. pp. 63-68. 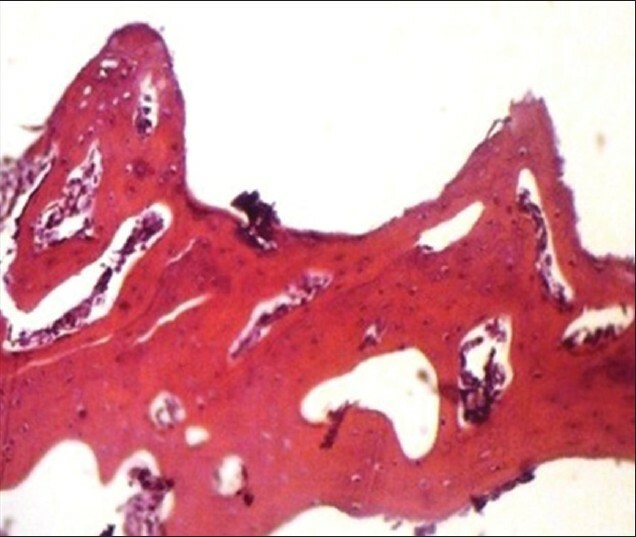 Sabir A, Tabbu CR, Agustiono P, Sosroseno W. Histological analysis of rat dental pulp tissue capped with propolis. J Oral Sci 2005;47:135-8. Al-Molla B. The effects of the Iraqi propolis on the artificial bony defects on the rabbit's randible. Msc thesis, collage of Dentistry. Univ Baghdad; 2007. AL-Zubaydi T, Al-Hijazi, Al-Ghani B. In vivo study of the effect of collagen protein coated implant as compared with implants coated with a mixture of partially stabilized zirconia and collagen on Osseointegration. J Bagh Coll Dent 2011;23:108-16. Al-Ghani B, Al-Hijazi A, AL-Zubaydi T. In vivo immunohistochemical investegation of bone deposition at collagen coated Ti implant surface. J Bagh Coll Dent 2011;23:10-5. Sun P, Wang J, Zheng Y, Fan Y, Gu Z. BMP2/7 heterodimer is a stronger inducer of bone regeneration in peri-implant bone defects model than BMP2 or BMP7 homodimer. Dent Mater J 2012;31:239-48. Sodek J, Cheifitz S. Molecular regulation of osteogenesis. In: Davies JE, editor. Bone engineering. Toronto: Em squared In; 2000. p. 31-43. Jamil B. Role of biomaterial collagencoated titanium implants surface on expression of bone protein markers and osseointegratin reaction, in comparison to titanium implant coated with zirconia. PhD thesis, collage of Dentistry. University of Baghdad; 2011. Niehaus AJ, Anderson DE, Samii VF, Weisbrode SE, Johnson JK, Noon MS, et al. Effects of orthopedic implants with a polycaprolactone polymer coating containing bone morphogenetic protein-2 on osseointegration in bones of sheep. Am J Vet Res 2009;70:1416-25. Yoshinari M, Oda Y, Inoue T, Matsuzaka K, Shimono M. Bone response to calcium phosphate-coated and bisphosphonate-immobilized titanium implants. Biomaterials 2003;23:2879-85. Gartner L, Hiatt J. Color Textbook of Histology. 2 nd ed., Ch. 6. W. B. Saunders Co; 2001. p. 116-24. Nanci A. 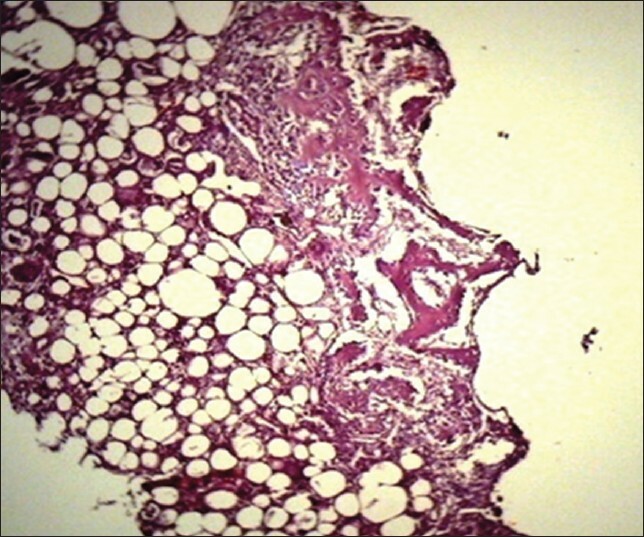 Ten Cate's oral histology. Development, Structure and Function. 6 th ed. Mosby Co; 2013. p. 111-145, 397-403. Wiêckiewicz W, Miernik M, Wiêckiewicz M, Morawiec T. Does propolis help to maintain oral health? Evid Based Complement Alternat Med 2013;2013:351062. Altan BA, Kara IM, Nalcaci R, Ozan F, Erdogan S, Ozkut MM, et al. Systemic propolis stimulates new bone formation at the expanded suture: A histomorphometric study. Angle Orthod 2013;83:286-91. Gjertsen AW, Stothz KA, Neiva KG, Pileggi R. Effect of propolis on proliferation and apoptosis of periodontal ligament fibroblasts. Oral Surg Oral Med Oral Pathol Oral Radiol Endod 2011;112:843-8. Toker H, Ozdemir H, Eren K, Ozer H, Sahin G. N-Acetylcysteine, a thiol antioxidant, decreases alveolar bone loss in experimental periodontitis in rats. J Periodontol 2009;80:672-8. Novaes AB Jr, de Souza SL, de Barros RR, Pereira KK, Iezzi G, Piattelli A. Influence of implant surfaces on osseointegration. Braz Dent J 2010;21:471-81.
von Wilmowsky C, Bauer S, Roedl S, Neukam FW, Schmuki P, Schlegel KA. Effect of diameter of anodic TiO2 nanotubes on bone formation and correlates with the bone morphogenetic protein-2 expression in vivo. Clin Oral Implants Res 2012;23:359-66. Bonewald L. Osteocytes as dynamic multifunctional cells of growth factors and cytokines on osteoblast differentiation. Periodontol 2006;41:48-72.